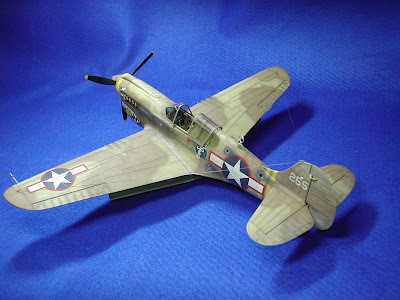 Recently released, built, painted and completed is this new Curtiss Warhawk. 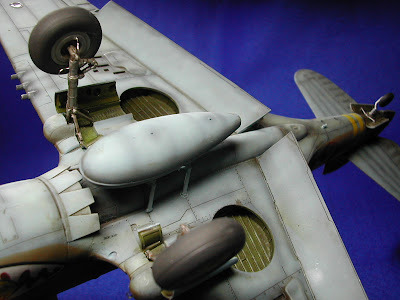 This is the new P-40K in 1/32 scale from Hasegawa. Although not a direct scale-up from their 1/48 scale kit, there are of course inevitable similarities. 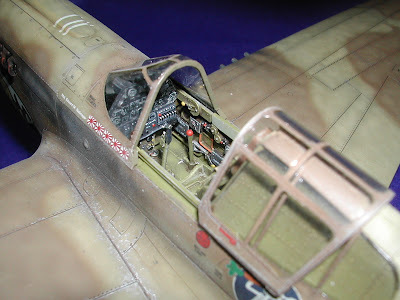 However, the 1/32 offers more detail in the cockpit and it overcomes the sticky problem of the rear windows with some imaginative moulding of certain clear parts. The kit builds really well with that very satisfying 'large model' feel about it. 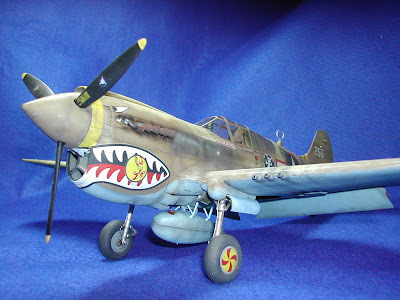 Two decal options are offered in the kit: 'Hydes Harlot' in olive drab and tan complete with a snake's head on the nose, and the obvious choice, the Flying Tigers P-40 flown by Edward M. Nollmeyer. It features personal emblems, red-edged national markings, yellow stripes and the very striking tiger's face. What's not to like?